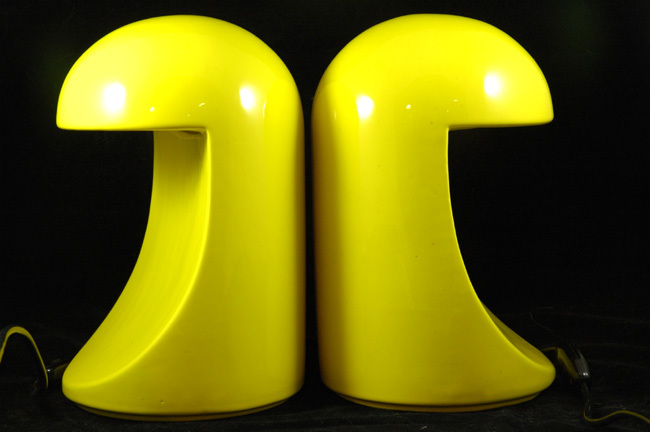 Pair of bright yellow "Longobarda" ceramic lamps designed in 1966 by Italian Architect Marcello Cuneo for Gabianelli (Italy). Writing-desk lamp ceramics in one piece designed in 1966, it was awarded the 1967 "Palladio" Prize for industrial design applied to ceramics. In 1972 it was exhibited at New York's Museum of Modern Art (MOMA) during the "Italy: new domestic landscape" exhibition"